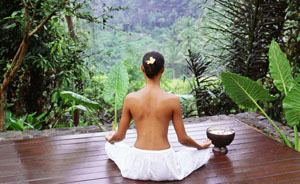 Would You Like to do a Detox Retreat in Bali? How would you like to join us at an amazing eight day detox retreat in beautiful Bali in March? You could be one of those lucky people if you choose to join us at the March Embracing Life! Bali Retreat! With just over six weeks to go until it starts on the 2nd March, there are just six places left until we are totally booked out – so now is the time to make the decision and snap up one of these few last spots! Bali is such a perfect place to do a retreat, and Ubud, the spiritual centre of Bali is a peaceful and idyllic setting, well away from the busy tourist areas. We settle into our little piece of paradise for our retreat on Friday the 2nd of March, and enjoy eight nights of not only a first-class health and detoxification experience, but we also explore the culture of Bali with some half-day trips and cultural ceremonies. At just $2695 for eight nights including all food and drinks, airport transfers, daily yoga, massage, colonics, lectures, workbooks, food prep classes with world class raw food chef Julie Mitsios, gift bags and much, much more – this is the perfect time to combine an overseas holiday and take your health to a new level! Next post: Resolutions to Realities – Using VB!